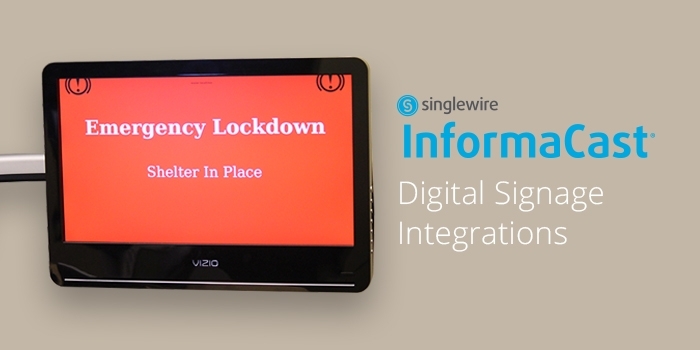 With InformaCast, our goal is to give our customers a solution that can connect to any system they want to leverage for emergency notifications. This includes digital signage our customers want to have display emergency notifications on screens around a building or campus. We offer several documented integrations with different digital signage vendors available to registered users in our Community. The digital signage market is relatively fragmented, however, InformaCast will work with many digital signage vendors, even if they are not listed on our ecosystem partner page. We only list partners for which we’ve already documented an integration method, but as customers come forward and ask about a particular brand, we add it to the list. How Will You Send a Message? In order of preference, our integration methods include sending a REST API call, outbound RSS, e-mail and custom scripting. Four Winds, and many other vendors, accept an RSS feed. Brightsign uses an InformaCast script that sends it a UDP message. InformaCast’s script for Industry Weapon sends to its API. The bottom line: many customers want to leverage their investment in existing digital signage. If that signage vendor has a REST API or accepts inbound RSS, it’s highly likely that an InformaCast administrator will be able to complete the integration on their own with simple configuration.